The Coens are clever directors who know too much about movies and too little about real life. The adolescent experiences of the young Coen brothers, Joel and Ethan, forced indoors by frigid Minnesota winters, provides a remarkably crystalline metaphor for their later film work. It is easy to imagine the brothers peering out their living-room window to witness the very particular and precise ethnographic detail which would find careful representation in their best received film, Fargo (1996), then turning to their television-set to observe a Frank Capra comedy or Preston Sturges farce and discovering moments, characters, narratives and themes which would find illustration in their most mannered and artificial work, The Hudsucker Proxy (1993). The Coens have been drawn to two seemingly irresolvable modes of expression: ethnographic regionalism and artificial fabrication. It is between these two extremes that the remainder of their films can be mapped. Ironically, it has been these twin aspects of Joel and Ethan Coen’s work—particularised communities and artificial constructions—which has provided the most potent ammunition for critics. The Coens’ detailed reconstruction of identifiable communities, with all their quirks and eccentricities, has led many critics to accuse them of adopting a lofty superiority to their characters. Yet, when they construct a world with no resemblance to reality they are charged with avoiding moral or ethical expression. Nearly 20 years since they made their debut with the independently financed Blood Simple, the Coen brothers remain in critical limbo—considered to be neither serious artists nor commercial achievers. 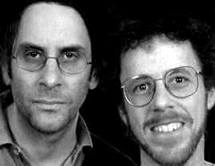 Joel and Ethan Coen were born in Minnesota to academic parents. The brothers were raised in a typical middle-American, middle-class Jewish household. Their childhood was largely unremarkable and aside from the production of a few super-8 home movies, a future in filmmaking seemed unlikely (Ethan’s book of short stories entitled Gates Of Eden contains pseudo-biographical, though ‘fictional’, narratives of the Coens’ upbringing). (2) Joel proceeded to New York University where, in lieu anything better, he enrolled in a film course. Ethan, on the other hand, ventured to Princeton; choosing Philosophy as his major, he composed a thesis on Wittgenstein. Joel’s film school experience would assist him in landing a number of editing jobs on small budget films, providing him with exposure to film production practices. With this grounding the brothers were motivated to make their own film. With the help of investors from the local Minnesota business community the Coens set about making their first feature length film—Blood Simple. Joel and Ethan wrote, directed and produced the film, a working regime they have maintained thus far in their career. They also edit most of their movies using the single pseudonym Roderick Jaynes. Though nominally Joel directs and Ethan produces, their duties are said to be shared. 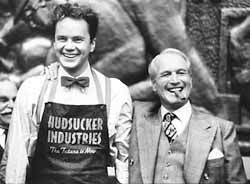 Whilst working with the Coens on The Hudsucker Proxy, Paul Newman claimed he had “never had two directors…[and]…never worked with two guys who had equal creative authority who didn’t squabble.” (3) That the Coen brothers don’t ‘squabble’ reflects the total control they maintain over their vision from script to screen. Anecdotal reports suggest that actors who skip words (even seemingly insignificant dialogue) in line readings are politely requested to repeat the exercise with complete accuracy. The films of the Coen brothers are also rigorously story-boarded, ensuring the visual conception is affirmed and preserved by the many other creative talents—cinematographers, actors, editors—involved in the production of their films. What becomes apparent in the brothers’ approach to movie-making is a desire to control their films completely. In their postmodern films, such as The Hudsucker Proxy and Barton Fink, ethnocentric detail is rejected and replaced by allusions to popular culture. This ties in with the Coen brothers’ rampant application of pre-existing source material in new and ironic ways. It is this element, common in many of their films, which lends weight to the charge that their films are empty of new ideas or moral positions. Todd McCarthy argues, with respect to The Hudsucker Proxy, that “rehashes of old movies, no matter how inspired, are almost by definition synthetic, and the fact is that nearly all the characters are constructs rather than human beings with who the viewer can connect.” (5) Yet, when the Coens construct ‘human beings’ they are often accused of adopting a mocking tone to them. Devin McKinney suggests Fargo is “a fatuous piece of nonsense, a tall cool drink of witless condescension” (6) and Emanuel Levy claims that the Coens “have always treated their characters with contempt, ruthlessly manipulating and loathing their foolishness.” (7) The fascination with language, the application of postmodern techniques, attention to regionalism and charges of arrogant superiority are the most common themes upon which the work of the Coen brothers is appraised. Joel and Ethan Coen have worked within the realms of various genres, adopting appropriate methods of realisation to reflect these representational frameworks. The dialogue in their films is a prominent factor in the organisation and maintenance of these generic constructions and in the fulfilment of specific stylistic strategies. The Hudsucker Proxy‘s synthetic visual design is mirrored by its stylised dialogue, the criminal milieu of Miller’s Crossing is characterised by memorably rich gangster jargon, while Fargo‘s attention to visual realism operates concurrently with the application of an appropriate regional dialect. Barry Sonnenfield—the director of photography on Raising Arizona—suggests that the script has greatest priority to the Coens, arguing that words and structure are more important than any visual concerns. (8) Language operates as a cue to the themes and characters in the films of Joel and Ethan Coen. That they construct dialogue of wonderful inarticulacy, such as the Dude’s (Jeff Bridges) scrambled speeches in The Big Lebowski and Carl’s (Steve Buscemi) consistent malapropism in Fargo, is not merely a joke at the expense of their characters but rather the critical interrogation of communication breakdown. The premise of Blood Simple evolves upon the protagonists’ inability to communicate effectively, their private discourses breeding distrust and confusion that ultimately leads to the tragic consequences at the film’s conclusion. James Mottram observes that the “four main protagonists, although existing in a unified physical world, inhabit a separate mental and emotional space that causes repeated misinterpretations.” (9) With Fargo and The Big Lebowski the Coens have extended this philosophy of miscommunication to an ailment of society in which inarticulacy is an observable symptom. The language styles pursued by the characters in these films frequently betray repressed or unconscious desires that expose the value systems of modern cultures. Jeff Evans detects the irony inherent in the dialogue of Raising Arizona as stemming in part from a gulf that exists between the florid, loquacious and poetic speech of the characters and their sparse, homely and modest physical reality. (10) H.I. 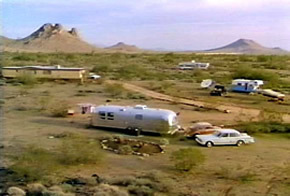 (Nicolas Cage) at one point, describes his and Ed’s (Holly Hunter) motor-home existence in the middle of the barren plains of the Arizona desert as “the salad days”. Raising Arizona is to some extent about a desire to improve one’s position; H.I., a confirmed recidivist, wants to marry, work, build a home and start a family. He is after the American dream of prosperity, and in dialogue he has found a way to fabricate a chimera of success, having failed to achieve it in a material sense. The moral of the film will finally suggest that this material success is a charade, and that true happiness and prosperity comes from the modest pursuit of doing the right thing. This emphasis on the absence of meaning in language is an earnest critique of aspects of America’s culture; of the views and values, prejudices and hegemonies in these societies. The dialogue in the films of the Coen brothers offers insight into dominant ideologies, endeavoring to examine how language works to maintain certain standards and beliefs. With Blood Simple Joel and Ethan Coen use Texas to develop a similarly surreal environment, of flat, featureless plains, endless highways and stifling heat. The Coens’ most recent film, The Man Who Wasn’t There, returns to James Cain as a touchstone, reinventing his fiction through the subversion of its generic and literary conventions. The Man Who Wasn’t There is set in traditional Cain country—a Californian town named Santa Rosa. But the Coens are less interested here in representing an authentic Californian community and more concerned with manufacturing a stylised film noir cosmos swathed in existentialist apathy and passivity. Miller’s Crossing is also set in an intensely rhetorical world, every setting seems overly precise and affected, not so much a step back in time, more like a return to familiar representations from the past. Ethan Coen declared that in Miller’s Crossing “the city’s an anonymous one, the typical ‘corrupted town’ of Hammett novels.” (13) Fargo, on the other hand seems to carry with it a documentary authenticity. The film’s prologue—which attests to the veracity of the depicted events—may be a red herring, but it does acknowledge the film’s agenda—the maintenance of a coherent system of realism. The peculiar snow-capped setting and the equally exotic Scandinavian-inflected dialogue reinforces the particularly provincial nature of the representation. Whereas Minnesota is integral to the design and conception of Fargo, Los Angeles is fundamental to The Big Lebowski. Josh Levine argues that the Coens populated The Big Lebowski with types who could not exist anywhere else but “in the sunny land of complete informalness and surreal juxtapositions.” (14) The wandering-intrigue narrative of The Big Lebowski is perfectly suited to experiencing the widely diverse and divergent community of Los Angeles, a culture equally receptive to doped-out slackers, right-wing militants, German nihilists, Malibu pornographers and a pederast named Jesus (John Turturro). Barton Fink is also set in Los Angeles but its specific placement in the more particularised culture of Hollywood allows for a more fantastic conception. Joel and Ethan Coen’s interpretation of Hollywood in Barton Fink is less a denotative representation and more a symbolic interpretation. The Coens place the eponymous hero Barton (John Turturro) in a living hell when he sells his creative soul to a motion picture studio. Barton Fink contains a stimulating mix of accepted history, anecdotal and apocryphal elements and pure fiction. A similar methodology is adopted for O Brother, Where Art Thou? which offers a technically precise and culturally astute recreation of 1930s deep-south America but frames the narrative using Homer’s The Odyssey. The mixture of historical detail with an archetypal fiction narrative is a postmodern paradigm. Yet, neither of these films come close to The Hudsucker Proxy for re-imagining the past. With The Hudsucker Proxy the Coens eschew all resemblance to reality to produce a remarkably artificial world that owes almost all of its inspiration to old movies. The films of Joel and Ethan Coen are not merely constructed from the pieces of other films and references are not drawn solely from the domain of cinema history. The Coens seek to work with well known source material, extracting the essence of an author’s approach and re-deploying this style within a different and original environment. 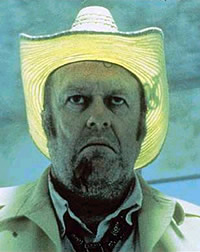 With Blood Simple the Coens endeavor to re-contextualise the basic elements of the James Cain novel. 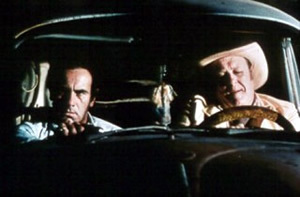 Blood Simple owes a notable debt to the style of James Cain, but also to film noir, neo-noir, the tenets of independent film in the 1980s, the crime genre and the eccentricities of Texas culture. The Coen brothers’ films negotiate the issue of fidelity by furnishing adaptations that reject a linear relationship to one model or source text. Miller’s Crossing is based loosely on two Dashiell Hammett novels, The Glass Key and Red Harvest, and it also engages in a more general sense with Hammett’s style and themes. The Big Lebowski is perhaps more ambitious as the Coens, influenced by Raymond Chandler, fashion a story around the world of a doped out loser and social-league ten-pin bowling. With The Man Who Wasn’t There, Joel and Ethan Coen return to James M. Cain. But once again the relationship to their inspiration remains paradoxical. The Man Who Wasn’t There is concerned with transgressing many of film noir‘s most important conventions, summarily problematising its connection to James Cain, a chief inspiration for the entire noir movement. The Coens have chosen to exclude all emotion from their protagonist, the monotone Ed (Billy Bob Thornton), to make him as dispassionate and detached as possible, prompting Graham Fuller to categorise the film “anti-noir”. (15) Without the crucial elements of passion, desire and sexuality, The Man Who Wasn’t There undermines the very genre that frames it. Barton Fink is less a subversion of generic conventions and more an ironic reexamination of history. It is both a critique of the Hollywood system then and now, and a reworking of the myth of the leftist artist in the 1930s. It seems, with Barton Fink, the Coens secure great enjoyment in debunking the typical celebration of the common man by exposing the egotistical motives that trump altruistic intention. The Coens subvert the myth of the suffering playwright with their depiction of Barton Fink as a pompous and self-absorbed author who is out of touch with the very people he claims to write for, and about. The Coen brothers have sought to rework and reevaluate the past by engaging with history in a hyper-critical way. The self-conscious manner of the Coen brothers’ films always foregrounds both history’s and fiction’s textuality. In the films of the Coen brothers the process of story-telling is often laid open to exposition and demonstration. Barton Fink is a Hollywood film set in Hollywood, the hub of American story-telling. The Hudsucker Proxy is a defiantly referential film that overtly exposes its textual design; the film’s narrator, an initial indication of the text’s narrativity, stops the film midstream and directly addresses the audience. O Brother, Where Art Thou? foregrounds the narrative framework of its trajectory in the opening credits when the brothers cite The Odyssey as the film’s basis. With Barton Fink, The Hudsucker Proxy and O Brother, Where Art Thou? the Coen brothers are highly self-conscious in the manner of their storytelling. Their narrative tools, particularly in The Hudsucker Proxy, are often deftly self-reflexive. To insist on exposing the devices of construction immediately cues the viewer to the construction of all texts. Linda Hutcheon identifies a mode of “metacinema” in which the formation process of subjectivity and narrativity has become a staple. (16) And it would appear that the Coen brothers’ films befit such a classification. 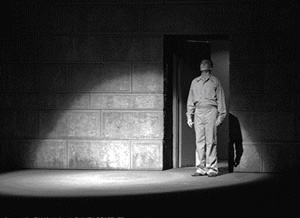 Their use of distancing narrational modes such as voice-over exposition in Raising Arizona and The Man Who Wasn’t There, the direct address prologue in Blood Simple and The Big Lebowski, and the rigid application of generic convention in Miller’s Crossing are all elements which foreground the construction processes involved. This assertion highlights the very important manner by which postmodern representations call upon the reader/viewer to complete the text. The role of memory, reception and intertextuality are crucial to the design in the Coen brothers’ films. By engaging the texts of the past the directors are able to challenge and critique history through the agency of parody, irony and self-reflexivity. This confrontation with history’s textual construction enables an exploration and interpretation of ideologies of the past. 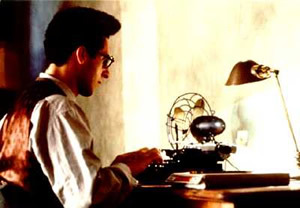 Despite all the criticism of their work—their films are merely about other films, their work smugly proposes the emptiness at the core of art, they hide behind style to avoid moral and ethical issues—the Coen brothers nevertheless set up a connection to history through their pithy investigation into the texts that represent the past. With their keen approach to historical periods and texts of bygone eras, and their reliance on irony and parody, the Coen brothers not only engage with history but they question and challenge the ideologies by which it is constructed. The aspects of Fargo that undermine and rally against film convention and focus on characteristics more attuned to reality give it a naturalistic identity. Emphasising a character’s ineptitude is inextricably linked to an expression of reality and need not be evident of a specific agenda to ridicule a community or a society. Joel and Ethan Coen are often censured for failing to commit to moral or ethical positions and chastised for constructing worlds of artificiality. But the truth is, manifest in Levy’s pointed condemnation (located at the beginning of this essay), the Coens are victims of a critical establishment which considers visual documentation—film and television—to be unworthy conveyers of the past. The Coen brothers do know too much about film, they know enough to recognise the conceits of its processes and to detect the values that such systems are designed to support. And they know enough to subvert and criticise these systems in order to construct a valid and important engagement with the past, encapsulating very effective and substantial moral and ethical explorations. The Coen brothers’ wonderful ear for dialogue, rigid attention to regional re-constructions, inventive approach to the past, in addition to their professional skill and adroit technique has resulted in some of the most enjoyable (and critically worthy) contemporary films. Three .avi clips from The Big Lebowski. Straightforward film analysis and biographical information. News on the site hasn’t been updated since September 2002. Summary of each of the films of Joel and Ethan Coen, lacking any true critical engagement. Enjoyable fan site with script, deleted scenes, actor information and images from Miller’s Crossing. 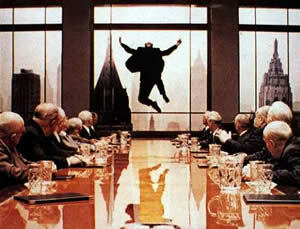 Contains a glossary for those who get lost in Miller’s Crossing‘s tangled gangster jargon. Substantial effort at cataloguing a wide variety of information on the Coen brothers and their films, marred by a poor layout. Includes reviews, scripts, multimedia and forum. News on the site hasn’t been updated since November 2002. Ethan Coen, Gates of Eden, William Morrow, New York, 1998. See, in particular, the stories “The Old Country” and “The Boys”. McKinney, p. 25. The reference to talk-show audiences complaining about the characters’ depiction is cited in Levine, p. 135. Paul Coughlin is currently completing a Doctorate in the School of Literary, Visual and Performance Studies at Monash University, Melbourne, Australia. His research focuses on the films of Joel and Ethan Coen.